· The sinus node is the pacemaker of the heart. It contains cells with automatic properties that are capable of generating electrical impulses. When the sinus node discharges, it does not leave any imprint in the electrocardiogram (ECG). The sinus impulse is recognized only when it has propagated to the atria causing a small deflection called a P wave. The impulse from the sinus node is called normal sinus rhythm. · Sinus node dysfunction: Sinus node dysfunction occurs when the sinus node fails to function as the pacemaker of the heart. Slowing of the heart because of sinus node dysfunction should not be confused with slowing of the heart because of atrioventricular (AV) block. o Sinus dysfunction: When the sinus node completely fails as the pacemaker of the heart, a long period of asystole will occur. The ECG will record a long flat line without P waves (Fig. 12.1A). The long pause is frequently terminated by escape complexes from the atria or ventricles. o AV block: When there is complete AV block, sinus P waves are present, but are not conducted to the ventricles. The presence of sinus P waves indicates that the sinus node is functioning normally and is generating impulses that conduct to the atria, but is blocked on its way to the ventricles (Fig. 12.1B). Figure 12.1: Sinus Node Dysfunction versus Atrioventricular (AV) Block. (A)When bradycardia or asystole is due to sinus node dysfunction, no P waves will be recorded in the electrocardiogram. (B)When bradycardia or ventricular asystole is due to AV block, sinus P waves are present but are not followed by QRS complexes because the atrial impulses are blocked on their way to the ventricles. · Sinus node dysfunction: Sinus node dysfunction can be due to intrinsic or extrinsic causes. o Intrinsic causes of sinus node dysfunction: Intrinsic disease of the sinus node is associated with structural changes in the sinus node itself or the surrounding atria resulting in progressive deterioration in sinus node function. This may be due to ischemia, inflammation, infection, infiltrative, metastatic or rheumatic diseases, surgical injury, collagen disease, sclerosis, fibrosis, or idiopathic degenerative diseases that often involve the whole conduction system. Sinus node dysfunction can be manifested by a number of arrhythmias, although the underlying rhythm disorder is always a bradycardia. About half of all permanent pacemakers in the United States are implanted because of sinus node dysfunction. Before sinus node dysfunction is attributed to sick sinus syndrome, which is progressive and usually irreversible, extrinsic causes, which are reversible, should be excluded. o Extrinsic and reversible sinus node dysfunction: The sinus node can be suppressed by neurocardiogenic reflexes; enhanced vagal tone; hypothermia; hypoxia and hypercapnia (especially during sleep apnea); increased intracranial pressure; hypothyroidism; hyperkalemia; and drugs that can suppress the sinus node such as lithium, amitriptyline, clonidine, methyldopa, beta blockers, non-ihydropyridine calcium channel blockers, amiodarone, sotalol, and digitalis. Sinus suppression from extrinsic causes is usually reversible and should be differentiated from intrinsic disease of the sinus node. · Arrhythmias associated with sick sinus syndrome: Sick sinus syndrome should be suspected when any of the following arrhythmias occur. Except for the tachycardia-bradycardia syndrome, these arrhythmias may be difficult to differentiate from extrinsic and reversible causes of sinus node dysfunction. Figure 12.2: Sinus Bradycardia. The rhythm is sinus bradycardia with a rate of 42 beats per minute. Although sinus bradycardia is commonly seen in normal healthy and well-conditioned individuals, the slow sinus rate may also be a sign of sick sinus syndrome. · Inappropriate sinus bradycardia: When there is structural disease of the sinus node, one of the manifestations is abnormal slowing of the sinus rate, resulting in sinus bradycardia. Sinus bradycardia is defined as a sinus rate of <60 beats per minute (bpm). It is a normal finding during rest or sleep. Sinus bradycardia is seldom a cause of concern until it becomes unusually slow at <50 bpm. Sinus bradycardia of 40 to 50 bpm is often seen in normal healthy, well-conditioned athletes (Fig. 12.2). Thus, marked sinus bradycardia occurring in healthy individuals may be difficult to differentiate from inappropriate sinus bradycardia occurring in patients with sick sinus syndrome. The sinus bradycardia is inappropriate when it is unusually slow, is persistent, and does not increase sufficiently with exercise. For example, sinus bradycardia of <50 bpm may be appropriate for a patient who is asleep, but not for an individual who is physically active. · Chronotropic incompetence: A patient with sick sinus syndrome may or may not be bradycardic at rest, although there may be failure of the heart rate to increase sufficiently with exercise or with physical activity because of chronotropic incompetence. Chronotropic incompetence is diagnosed during exercise testing when the patient is unable to reach a heart rate equivalent to at least 80% of the maximum heart rate predicted for the patient's age. Although chronotropic incompetence may be a manifestation of sick sinus syndrome, there are so many other causes of failure to reach a certain target heart rate during exercise—most commonly, the use of pharmacologic agents that can suppress the sinus node (beta blockers and calcium channel blockers) as well as autonomic influences. Patients with chronotropic incompetence resulting from sick sinus syndrome with symptoms of low cardiac output is a Class I indication for permanent pacing according to the American College of Cardiology (ACC), American Heart Association (AHA), and Heart Rhythm Society (HRS) guidelines on implantation of permanent pacemakers. · Sinoatrial exit block and sinus arrest: Another manifestation of sinus node dysfunction is failure of the sinus impulse to conduct to the atria (SA exit block) or failure of the sinus node to generate an impulse (sinus arrest). o Sinoatrial exit block: In SA exit block, the sinus node continues to discharge at regular intervals, but some impulses are blocked and are unable to reach the surrounding atria. This can result in complete absence of an entire P-QRS-T complex. If two or more consecutive sinus impulses are blocked, the long P-P intervals representing the pauses are exact multiples of the shorter P-P intervals representing the basic rhythm (Fig. 12.3). The long pauses should be terminated by another sinus impulse and not by an escape complex, so that the P-P intervals can be measured. Thus, in SA exit block, a mathematical relation exists between the shorter P-P intervals and the long pauses. o Sinus arrest: In sinus arrest, the sinus node is unable to generate impulses regularly. Because the abnormality is one of impulse formation rather than impulse conduction, the pauses represented by the long P-P intervals, are not exact multiples of the shorter P-P intervals representing the basic sinus rhythm (Fig. 12.4). Figure 12.3: Sinoatrial Exit Block. In sinoatrial exit block, the P-P interval straddling a pause (A) is equal to two basic P-P intervals (B). The red heart represents an entire P-QRS-T that is missing. Figure 12.4: Sinus Arrest. The long pause (A) contains a P-P interval that is not equal to two basic P-P intervals (B). The pause represents sinus arrest. · Sinus pause: Sinus pause and sinus arrest are similar and either one can be used interchangeably to describe the other. Additionally, sinus arrest may be difficult to differentiate from SA exit block when the P-P intervals are irregular, such as when there is sinus arrhythmia or when an escape complex terminates a pause (Fig. 12.5). When these occur, the pause is simply a sinus pause because it cannot be identified as sinus arrest or exit block (Figs. 12.6 and 12.7). · Sinoatrial exit block: Similar to AV block, SA exit block can be divided into first-degree, second-degree, and third-degree block. First- and third-degree SA exit block are not recognizable in the surface ECG because the sinus node does not leave any imprint when it discharges. Only second-degree SA exit block can be identified. · Second-degree SA exit block: Second-degree SA exit block is further subdivided into type I, also called SA Wenckebach, and type II, SA exit block. The difference between type I and type II exit block is shown in Figure 12.8B, C.
· SA Wenckebach: Second-degree type I SA block or SA Wenckebach should always be suspected when there is group beating. In this group beating, some QRS complexes are clustered together because they are separated by pauses representing sinus impulses not conducted to the atria. Group beating is commonly seen in type I block because this type of block has a tendency to be repetitive. In SA Wenckebach, there is gradual delay in conduction between the sinus node and the atrium. Because sinus node to atrial interval cannot be measured, only the gradual shortening of the P-P or R-R intervals before the pause may be the only indication that SA Wenckebach is present (Fig. 12.9). · Thus, group beating with shortening of the P-P interval before the pause should always raise the possibility of SA Wenckebach as shown in Figures 12.8B, 12.9, and 12.10. InFigure 12.9, there is group beatings labeled #1 to #3. The shortening of the R-R (or P-P) intervals before the pause is better appreciated by the distances between the arrows at the bottom of the tracing, which represent the R-R intervals. Figure 12.5: Sinus Pause. A long pause of more than 3 seconds is terminated by a junctional escape complex (arrow). A long pause is usually due to sinus arrest. It is also called sinus pause. · Tachycardia-bradycardia syndrome: When the sinus node fails to function as the pacemaker of the heart, ectopic rhythms come to the rescue, which enhances the vulnerability of the patient to develop atrial arrhythmias, including atrial tachycardia, atrial flutter, or atrial fibrillation. These arrhythmias are usually sustained and most often become the dominant rhythm. During tachycardia or during atrial flutter or fibrillation, the presence of sinus node dysfunction is not obvious until the atrial arrhythmia terminates spontaneously. If there is sick sinus syndrome, the sinus node is unable to take over the pacemaking function of the heart and the long pause that follows is a frequent cause of syncope in tachycardia-bradycardia syndrome (Figs. 12.11 and 12.12). · Chronic atrial fibrillation: Atrial fibrillation is not an uncommon sequela of sick sinus syndrome. Before the era of cardiac pacemakers, atrial fibrillation may have been the only spontaneous cure for patients with significant bradycardia resulting from sinus node dysfunction. Unfortunately, atrial fibrillation may be intermittent and impermanent. When it terminates spontaneously, the sinus node is unable to provide any rhythm and a long asystole can occur (Figs. 12.13and 12.14). Figure 12.6: Sinoatrial Exit Block. The rhythm strips are continuous. A long period of asystole labeled distance A is equal to distance B. A contains three P-QRS-T complexes that are missing, which are marked by the red hearts. The long pause is due to sinoatrial exit block. ms, milliseconds. Figure 12.7: Sinoatrial Exit Block. In sinoatrial exit block, the P-P intervals are fixed. Note that the longer P-P intervals measure 2,080 milliseconds and are equal to two shorter P-P intervals, which measure 1,040 milliseconds. This is due to SA exit block. Each red heart represents an entire P-QRS-T complex that is missing. ms, milliseconds. Figure 12.8: Sinoatrial (SA) Exit Block. (A) Normal sinus rhythm. (B) Type I second degree SA Wenckebach. Shortening of the P-P intervals before a pause is the hallmark of SA Wenckebach. P-P interval #2 is shorter than P-P interval #1. The pause is represented by P-P interval #3. (C) Type II second-degree SA exit block. An entire P-QRS-T complex represented by the red heart is missing. This long P-P interval is equivalent to two P-P intervals straddling a sinus complex. (D) This rhythm is consistent with third-degree SA exit block, although this cannot be distinguished from sinus arrest. The sinus impulse cannot conduct to the atria hence sinus P waves are not present. Figure 12.9: Sinoatrial (SA) Wenckebach. The rhythm strips were recorded in lead II. SA Wenckebach should always be suspected when there is group beating labeled #1 to #3. These QRS complexes are grouped together because they are separated by pauses, which represent the sinus impulses that are not conducted to the atrium. Note also that there is gradual shortening of the R-R (or P-P) intervals before the pause as shown by the distances between the arrows. This is the hallmark of SA Wenckebach. The numbers between the arrows (between the QRS complexes) are in milliseconds. Figure 12.10: Group Beating in Sinoatrial (SA) Wenckebach. Lead II rhythm strip showing group beating similar to the electrocardiogram in Figure 12.9. There is also shortening of the R-R (or P-P) intervals before the long pauses consistent with SA Wenckebach. Figure 12.11: Tachycardia-Bradycardia Syndrome. The rhythm strips are continuous. Note that the atrial tachycardia is paroxysmal with sudden onset and termination. When the tachycardia terminates abruptly, long pauses follow, which are terminated by marked sinus bradycardia. Figure 12.12: Prolonged Asystole as a Result of Tachycardia-Bradycardia Syndrome. The two rhythm strips are simultaneous showing a supraventricular tachycardia followed by a long pause of more than 5 seconds before a junctional escape complex comes to the rescue. · Patients with chronic atrial fibrillation frequently undergo electrical cardioversion to convert the atrial fibrillation to normal sinus rhythm. After the atrial fibrillation is terminated by an electrical shock, the sinus node is unable to provide a sinus impulse, thus a long period of asystole may occur if the atrial fibrillation is due to sick sinus syndrome. Sick sinus syndrome should be suspected in patients with chronic atrial fibrillation when the ventricular rate is slow but are not on AV nodal blocking agents because sick sinus syndrome is often due to degenerative disease that involves not only the sinus node, but also the whole AV conduction system. Figure 12.13: Sick Sinus Syndrome Manifesting as Atrial Fibrillation. Lead II rhythm strip showing atrial fibrillation. Long pauses can occur when there is sick sinus syndrome because the sinus node is unable to provide a sinus impulse when the atrial fibrillation terminates spontaneously. These long pauses can cause syncope or sudden death. · Escape rhythms: When the rate of the sinus node becomes unusually slow, escape rhythms may originate from the atria, AV junction, or ventricles. These cells have intrinsically slower rates than the sinus node and usually do not become manifest because they are depolarized by the propagated sinus impulse. When there is sinus node dysfunction or when there is AV block (see Chapter 8, Atrioventricular Block), these latent pacemakers may become the dominant pacemaker of the heart. o Atrial escape rhythm: The atrial impulse originates from cells in the atria usually at the area of the coronary sinus and is followed by a narrow QRS complex (Fig. 12.15). o AV junctional rhythm: The AV junction includes the AV node down to the bifurcation of the bundle of His. The escape impulse usually originates below the AV node at its junction with the bundle of His and has a rate of 40 to 60 bpm 12.16). o Ventricular escape rhythm: Instead of the atria or AV junction, the ventricles may be the origin of the escape complex. A ventricular escape complex is wide, measuring ≥0.12 seconds because it originates below the bifurcation of the bundle of His (Fig. 12.17). Figure 12.14: Sick Sinus Syndrome and Atrial Fibrillation. Rhythm strip showing atrial fibrillation followed by a long period of asystole of >5 seconds spontaneously terminated by a junctional escape complex. 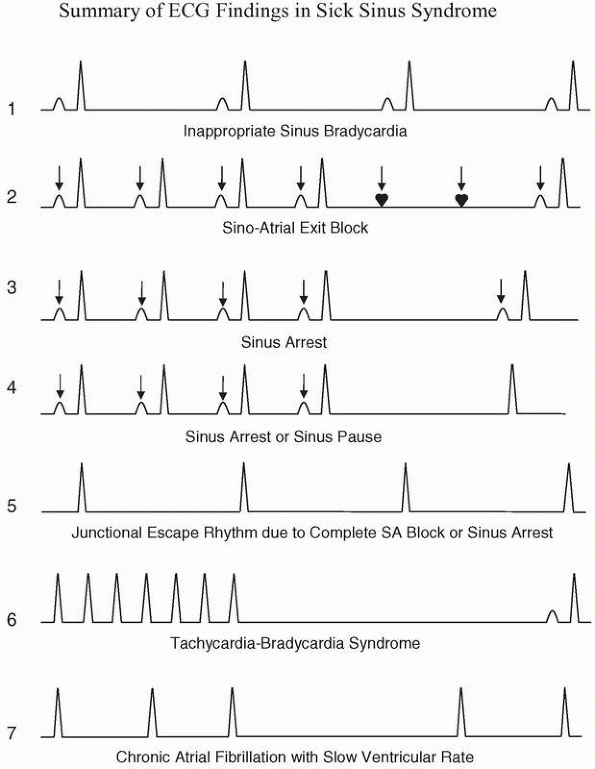 · AV junctional escape complex: AV junctional escape rhythms are the most common escape rhythms when there is bradycardia resulting from sinus node dysfunction or AV block (Fig. 12.18). The ectopic impulse may or may not be associated with retrograde P waves. When retrograde P waves are present, they may occur before or after the QRS complex and are inverted in leads II, III, and aVF (Fig. 12.19). o P waves before the QRS complex: Retrograde P waves will occur in front of the QRS complex if conduction of the impulse to the atria is faster than conduction of the impulse to the ventricles. This type of junctional escape rhythm may be difficult to differentiate from an atrial escape complex. If the impulse is junctional, the PR interval is usually short, measuring <0.12 seconds, and the retrograde P waves are usually narrow because the impulse originates from the AV node, causing both atria to be activated simultaneously. o No P waves: When P waves are absent, the impulse may be blocked at the AV node or the retrograde P wave may be synchronous with the QRS complex. This occurs when the speed of conduction of the impulse to the atria is the same as the speed of conduction of the impulse to the ventricles (Fig. 12.18). Figure 12.15: Atrial Escape Rhythm. Atrial escape complexes (arrows) can become the dominant pacemaker when there is slowing of the sinus impulse. o P waves after the QRS complex: The retrograde P waves may occur after the QRS complex if conduction of the impulse to the ventricles is faster than conduction of the impulse to the atria. 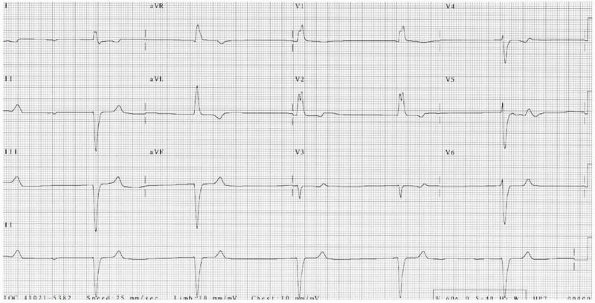 · The 12-lead ECG of a patient with AV junctional escape rhythm resulting from sinus node dysfunction (Fig. 12.20) and another patient with ventricular escape rhythm also from sinus node dysfunction (Fig. 12.21) are shown. · Wandering atrial pacemaker: Escape complexes may originate from two or more locations in the atria and compete with the sinus node as the pacemaker of the heart (Fig. 12.22). Ectopic impulses from the AV junction may also compete as pacemaker as shown in Figure 12.23. In wandering atrial pacemaker, the ectopic atrial impulses have the same rate as the sinus node (Figs. 12.22 and 12.23) and may even be late or slower (Fig. 12.24). Thus, the rhythm passively shifts from sinus node to ectopic atrial. They should not be confused with multifocal or chaotic atrial rhythm where the atrial complexes are premature and anticipate the next sinus impulse. · Accelerated rhythms: Very often, these escape rhythms become accelerated and develop a rate that is faster than their intrinsic rates. Thus, when the rate of the AV junction is >40 to 60 bpm, the rhythm is called accelerated junctional rhythm (Fig. 12.25); when the ventricles exceed their intrinsic rate of 20 to 40 bpm, the rhythm is called accelerated idioventricular rhythm (Figs. 12.26 and 12.27). · Accelerated idioventricular rhythm: Two examples of accelerated idioventricular rhythm are shown in Figures 12.26 and 12.27. Accelerated idioventricular rhythm is a rhythm that is often confusing and difficult to recognize because the configuration of the QRS complexes varies depending on the origin of the ectopic impulse. Figure 12.16: Atrioventricular (AV) Junctional Escape Complex. Arrow points to an AV junctional escape complex. The escape complex terminates a long pause. Figure 12.17: Ventricular Escape Rhythm. Rhythm strip showing ventricular escape complexes (stars) terminating a sinus pause. The third complex (arrow) is a ventricular fusion complex. Figure 12.18: Junctional Escape Rhythm. Lead II rhythm strip showing junctional rhythm with a rate of 46 bpm with narrow QRS complexes and no P waves because of sinus node dysfunction. Figure 12.19: Junctional Escape Rhythm. Lead II rhythm strip showing junctional escape rhythm. The retrograde P waves are narrow and occur after (first arrow), within (second arrow), and before the QRS complexes (third, fourth, and fifth arrows). The retrograde P wave in the second complex deforms the terminal portion of the QRS complex and can be mistaken for an S wave. Figure 12.20: Atrioventricular (AV) Junctional Rhythm. Twelve-lead electrocardiogram showing total absence of sinus node activity. The rhythm is AV junctional with narrow QRS complexes. Figure 12.21: Ventricular Escape Rhythm. Twelve-lead electrocardiogram showing ventricular escape rhythm. The QRS complexes are wide with a regular rate of 34 bpm. There is no evidence of sinus node activity (no P waves) in the whole tracing. Figure 12.22: Wandering Atrial Pacemaker. The P waves have different morphologies and originate from different locations from the atria. The rate is approximately 80 beats per minute. Figure 12.23: Wandering Pacemaker. The morphology of the P waves is variable because the escape impulses originate from different locations in the atria and atrioventricular junction. Figure 12.24: Wandering Atrial Pacemaker. Lead II rhythm strip showing P waves with varying morphologies. The complexes originate from different foci in the atria and are late. Figure 12.25: Accelerated Junctional Rhythm. Lead II rhythm strip showing accelerated AV junctional rhythm, 73 bpm with retrograde P waves after the QRS complexes (arrows). Figure 12.26: Accelerated Idioventricular Rhythm (AIVR). The ventricular rate is 70 bpm. The QRS complexes are wide measuring ≥0.12 seconds, consistent with AIVR. The QRS complexes have right bundle branch block configuration and no P waves are present. Figure 12.27: Accelerated Idioventricular Rhythm (AIVR) with Ventriculoatrial Conduction. The ventricular rate is 54 bpm with wide QRS complexes consistent with AIVR. The configuration of the QRS complexes is different when compared with that shown in Figure 12.26. In addition, there is ventriculoatrial conduction with retrograde P waves after the QRS complexes (arrows). Figure 12.28: Hypersensitive Carotid Sinus. Sinus dysfunction is often due to vagal influences, including the presence of hypersensitive carotid sinus. When the carotid sinus is stimulated as shown, the pauses that follow generally do not last more than 3 seconds because they are normally terminated by escape complexes. Pauses of >3 seconds that occur spontaneously or during carotid sinus stimulation are abnormal, as in this example, indicating the presence of hypersensitive carotid sinus without adequate escape complexes. · Extrinsic causes of sinus node dysfunction: Examples of sinus node dysfunction not from sick sinus syndrome are shown in Figs. 12.28 and 12.29.
o Hypersensitive carotid sinus: Extrinsic or reversible causes of sinus node dysfunction include autonomic reflexes as well as the presence of hypersensitive carotid sinus. During carotid sinus stimulation, a long period of asystole can occur. In normal individuals, the pause should not exceed 3 seconds. A pause of 3 seconds or more is abnormal and suggests that a hypersensitive carotid sinus is present (Fig. 12.28). o Hyperkalemia: Hyperkalemia can also suppress sinus node function resulting in junctional escape rhythm as shown in Figure 12.29. Figure 12.29: Hyperkalemia. In hyperkalemia, P waves may disappear because of sinus suppression or marked slowing in the conduction of the sinus impulse in the atria. Impairment in sinus node function associated with hyperkalemia is reversible. · Blocked premature atrial complex (PAC): One of the most common errors in the diagnosis of sinus node dysfunction is the presence of blocked PACs. When a PAC is blocked, a pause follows because the atrial impulse is not conducted to the ventricles and is not followed by a QRS complex (see Chapter 13, Premature Supraventricular Complexes). The ectopic P wave is visible because it usually deforms the ST segment or T wave before the pause. Before sinus node dysfunction is considered as the cause of a sudden pause, a blocked PAC should always be excluded first because this is the most common cause of sudden lengthening of the R-R interval as shown in several examples (Figs. 12.30,12.31,12.32,12.33). Figure 12.30: Blocked Premature Atrial Complexes (PACs). The long R-R intervals are not due to sinus pauses but are due to blocked PACs. The first PAC (first arrow) is conducted with aberration. The last two PACs (middle and last arrows) are blocked. The PACs can be identified by the presence of P waves riding on top of the T wave of the previous complex (compare the T wave with arrows and those without). Thus, the T wave with a PAC looks taller when compared to the other T waves without PACs. 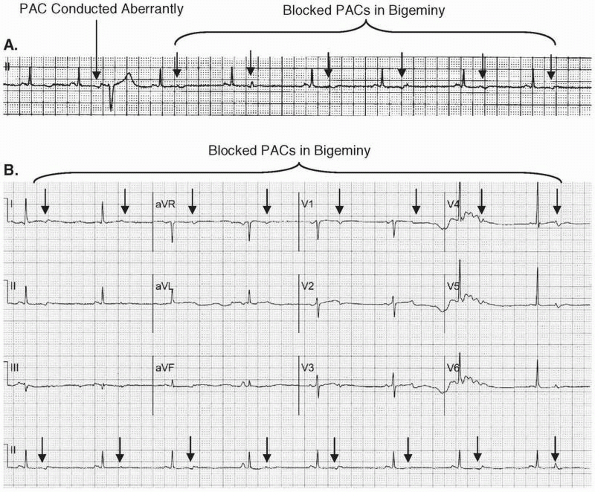 · Blocked PACs in bigeminy mistaken for sinus bradycardia: Blocked PACs occurring in bigeminy can be mistaken for sinus bradycardia as shown in Figure 12.34A, B. Figure 12.34Astarts with normal sinus rhythm at 74 bpm. The third complex is a PAC conducted aberrantly followed by normal sinus rhythm and a succession of blocked PACs in bigeminy (arrows). The 12-lead ECG in Figure 12.34B is from the same patient showing a slow rhythm with a rate of 44 bpm. The rhythm is slow not because of sinus bradycardia but because of blocked PACs in bigeminy. The atrial rate, including the blocked PACs, is actually double and is 88 beats per minute. · Sinus arrhythmia: Another common error that can be confused with sinus node dysfunction is sinus arrhythmia. In sinus arrhythmia, the sinus rate is irregular. Although sinus arrhythmia is a normal finding, the long P-P (or R-R) intervals can be easily mistaken for sinus pauses (Fig. 12.35). Sinus arrhythmia is more frequent and much more pronounced in infants and in young children. o In sinus arrhythmia, the difference between the longest and shortest P-P interval should be >10% or >0.12 seconds. o All P waves originate from the sinus node. Thus, the P waves are generally uniform in configuration and the P-R interval is usually the same throughout (Fig. 12.35). In Figure 12.36, the rhythm is not sinus arrhythmia because the P waves have different morphologies; thus, not all P waves are of sinus node origin. This is due to wandering atrial pacemaker and not sinus arrhythmia. o The shortening and lengthening of the P-P intervals are usually cyclic because sinus arrhythmia is commonly respiratory related, causing the intervals to shorten during inspiration and widen during expiration. This changing P-P interval is due to vagal effects. During inspiration, vagal influence is diminished causing the rate to increase. During expiration, the rate decreases as vagal influence is enhanced. Sinus arrhythmia may not be respiratory related when there is enhanced vagal tone, as would occur in patients who are taking digitalis. Figure 12.31: Blocked Premature Atrial Complexes (PACs). Note that whenever there is a long pause, the ST segment of the previous complex is deformed by a dimple marked by the arrows. The dimples represent nonconducted PACs. Note that there are no dimples in complexes without pauses. · Permanent pacemakers and sinus node dysfunction: The following are the indications for implantation of permanent pacemakers in patients with sinus node dysfunction according to the ACC/AHA/NASPE guidelines (Fig. 12.38). Figure 12.32: Blocked Premature Atrial Complexes (PACs). The arrow points to a nonconducted PAC, the most common cause of sudden lengthening of the P-P and R-R intervals. Figure 12.33: Blocked Premature Atrial Complexes (PACs) Resembling Sinus Pauses. The arrows point to nonconducted PACs superimposed on the T wave of the previous complex. The tall QRS complex is a premature ventricular impulse. Figure 12.34: Blocked Premature Atrial Complexes (PACs) in Bigeminy Resembling Sinus Bradycardia. (A) The rhythm is normal sinus at 74 beats per minute (first two sinus complexes on the left). The first arrow shows a PAC that is conducted with aberration. The subsequent PACs are blocked PACs occurring in bigeminy (arrows). (B) Twelve-lead electrocardiogram obtained from the same patient showing blocked PACs (arrows) in bigeminy. The slow heart rate can be mistaken for sinus bradycardia. Figure 12.35: Sinus Arrhythmia. The variation in P-P interval is due to sinus arrhythmia. In sinus arrhythmia, the longest P-P interval should measure >0.12 seconds when compared with the shortest P-P interval. The longer intervals may be mistaken for sinus arrest or sinus pause. Figure 12.36: This is not Sinus Arrhythmia. The rhythm strip shows irregular R-R intervals; however, the P waves (arrows) are not the same throughout because some are ectopic in origin. The rhythm is wandering atrial pacemaker. In sinus arrhythmia, all P waves should originate from the sinus node and should have the same configuration throughout. · The sinus node is the pacemaker of the heart and is the origin of the sinus impulse. Because the electrical impulse from the sinus node is not of sufficient magnitude, it does not cause any deflection in the surface ECG. The sinus impulse is recognized only when it has spread to the atria and is inscribed as a P wave in the ECG. The anatomy and electrophysiology of the sinus node and normal sinus rhythm has already been discussed elsewhere (see Chapter 1, Basic Anatomy and Electrophysiology). 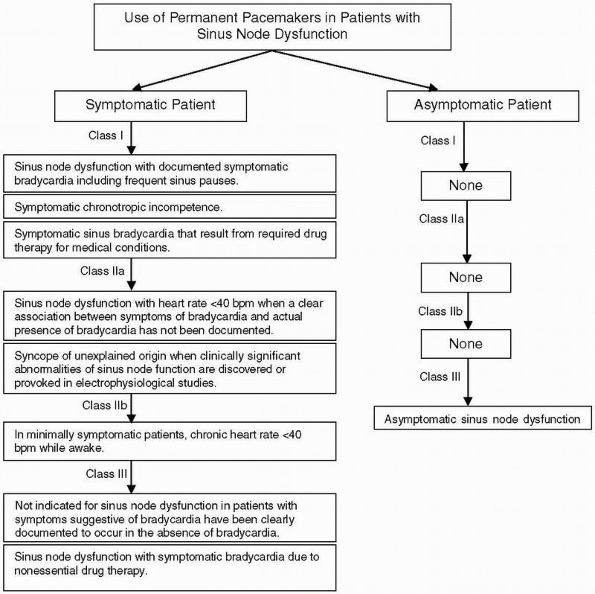 Figure 12.37: Diagrammatic Representation of the Different Arrhythmias Associated with Sick Sinus Syndrome. The arrows point to sinus P waves and the red hearts represent sinus impulses that are blocked. · When the sinus node fails to function as the pacemaker of the heart, supraventricular or ventricular escape impulses usually come to the rescue. If there are no escape impulses, the ultimate expression of total sinus failure is complete absence of P waves in the ECG, which is represented by a long flat line without any electrical activity. Unless an escape rhythm originating from the atria, AV junction, or ventricles comes to the rescue, syncope or sudden death can occur. Figure 12.38: Implantation of Permanent Pacemakers in Patients with Sinus Node Dysfunction According to the American College of Cardiology/American Heart Association/Heart Rhythm Society Guidelines. Class I: Condition in which there is evidence or agreement that a given procedure is useful and effective. Class IIa: The weight of evidence is in favor of usefulness or efficacy of the procedure or treatment. Class IIb: Efficacy of the procedure or treatment is less well established. Class III: The procedure or treatment is not useful or effective and in some cases may be harmful. Note that in patients with sinus node dysfunction, implantation of a permanent pacemaker is generally reserved for patients who are symptomatic. · Escape rhythms usually originate anywhere in the specialized AV conduction system except the middle portion of the AV node. These pacemakers are called latent pacemakers because they have a slower rate than the sinus impulse. They do not become manifest because they are normally discharged by the propagated sinus impulse. However, when the sinus node fails to function appropriately, these latent pacemakers may take over and become the dominant pacemaker of the heart. · The intrinsic rate of these latent or subsidiary pacemakers is slower than the intrinsic rate of the sinus node. For example, impulses originating from the AV junction have a rate of 40 to 60 bpm and impulses originating from the distal His-Purkinje system and ventricles have a rate of 20 to 40 bpm. The intrinsic rate of these ectopic impulses can become accelerated by sympathetic and parasympathetic influences. Thus, an AV junctional rhythm with a rate of >60 bpm is called accelerated junctional rhythm and a ventricular rhythm with a rate >40 is called accelerated idioventricular rhythm. · Sick sinus syndrome refers to the presence of sinus node dysfunction associated with structural abnormalities in the sinus node. It should not include extrinsic causes of sinus dysfunction, such as those resulting from pharmacologic agents that can suppress the SA node, hyperkalemia, neurocardiogenic reflexes including vagally mediated syncope, hypersensitive carotid sinus, increased intracranial pressure, sleep apnea, or hypothyroidism and other physiologic or functional changes that affect the sinus node, which are transient or reversible. Thus, the presence of sinus node dysfunction should always trigger a workup for reversible causes before the diagnosis of sick sinus syndrome is suspected. · Inappropriate sinus bradycardia: The manifestations of sick sinus syndrome may be very subtle and intermittent and may be difficult to differentiate from reversible sinus dysfunction. Between normal sinus function and total sinus node failure are varying gradations of sinus node dysfunction. One of the earliest manifestations is inappropriate sinus bradycardia. This arrhythmia is often difficult to differentiate from sinus bradycardia occurring in normal individuals, especially those who are athletic or well conditioned. When there is inappropriate sinus bradycardia, the rate of the sinus node is unusually slow and does not increase sufficiently with exercise. · Chronotropic incompetence: Chronotropic incompetence is failure of the sinus node to increase in rate during exercise. Most patients with chronotropic incompetence will not be able to attain 80% of their maximum predicted heart rate during exercise testing. The maximum (100%) predicted heart rate is calculated by subtracting the patients' age from 220. Thus, if the patient is 70 years of age, the maximum heart rate that is expected during maximal exercise is approximately 150 bpm (220 - 70 = 150 bpm). If the patient is unable to attain 80% of the predicted maximum heart rate, which is 120 bpm (150 × 0.80 = 120), the patient has chronotropic incompetence. · Other arrhythmias resulting in sinus node dysfunction include the following. o SA exit block: In SA exit block, the sinus node is able to generate impulses, but some impulses are blocked as they exit out to the surrounding atria. The main abnormality in SA exit block is one of impulse conduction. If one impulse is blocked, a whole P-QRS-T complex will be missing. The P-P interval can be measured if the pause is terminated by another sinus impulse but not by an escape rhythm. If the P-P interval of the long pauses is mathematically related to the shorter P-P intervals, the diagnosis is SA exit block. o Sinus arrest: In sinus arrest, the sinus node is unable to generate impulses intermittently; thus, the main abnormality is one of impulse formation. Sudden long pauses also occur, but these pauses are not mathematically related to the shorter P-P intervals; thus, the long P-P interval is not exact multiples of the shorter P-P intervals. o Sinus pause: Sinus pauses can be used interchangeably with sinus arrest because long pauses are most commonly the result of sinus arrest. In normal individuals, sinus pauses are commonly present but are short and do not exceed 3 seconds. When sinus pauses are longer than 3 seconds, sinus dysfunction should be suspected even if no symptoms are present. o Tachycardia-bradycardia syndrome and chronic atrial fibrillation: When the sinus node fails, sinus rhythm is often replaced by atrial fibrillation or atrial tachycardia. The atrial arrhythmia can further suppress sinus function because the atrial impulses do not only activate the atria, but can also penetrate and repeatedly depolarize the sinus node during atrial fibrillation or atrial tachycardia. When the atrial arrhythmia terminates spontaneously, the tachycardia is often followed by a long pause because sinus node function is suppressed. Unless the pause is terminated by an escape rhythm, the patient will become completely asystolic, resulting in syncope or sudden death. This can also occur when a patient with sinus dysfunction presents with chronic atrial fibrillation and is electrically cardioverted. After termination of the atrial fibrillation, a long asystolic period terminated by escape impulses usually occurs. o Escape rhythms originating from the atria, AV junction, or ventricles: These escape rhythms may become manifest when the sinus node defaults as the pacemaker of the heart or when there is complete AV block. These escape rhythms may be enhanced by sympathetic or parasympathetic influences and may become accelerated. Although accelerated junctional and ventricular rhythms may occur in normal healthy individuals as well as in patients with structural heart disease, these accelerated rhythms may be a sign of sinus node dysfunction. · The presence of sinus dysfunction is usually diagnosed by cardiac monitoring. The type of monitoring depends on the frequency of symptoms. o Holter monitor: Ambulatory Holter recording for 24 to 48 hours may be sufficient for most patients with frequent symptoms that occur almost on a daily basis. In other patients with intermittent symptoms, longer monitoring may be necessary. o Event recorder: The use of an event recorder that lasts 30 to 60 days may be necessary if symptoms are infrequent. o Implantable loop recorder: The use of an implantable monitoring device inserted subcutaneously may be necessary if the patient continues to be symptomatic and other monitoring techniques have not been useful. This is capable of monitoring the patient for 12 to 14 months. The loop recorder can also correlate whether the symptoms are related to other causes or other arrhythmias. · Other tests to identify the presence of sinus node dysfunction may include the following. not useful in the diagnosis of other arrhythmias resulting from sinus node dysfunction. o Electrophysiologic testing: This is an invasive test in which electrodes are introduced transvenously into the heart. Sinus node function is evaluated by measuring sinus node recovery time. This is performed by rapid atrial pacing resulting in overdrive suppression of the sinus node. When atrial pacing is abruptly discontinued, sinoatrial recovery time is measured from the last paced beat to the next spontaneously occurring sinus impulse, which is prolonged when there is sick sinus syndrome. The sensitivity of electrophysiologic testing in the diagnosis of bradyarrhythmias is generally low and is not routinely recommended. This is more commonly used to exclude ventricular arrhythmias in patients with coronary disease, especially when there is history of syncope. · Sick sinus syndrome may be due to ischemia, inflammation, infection including Lyme disease, rheumatic heart disease, pericarditis, collagen disease, muscular dystrophy, infiltrative diseases such as amyloid, sarcoid, hemochromatosis, hypothyroidism, and vascular diseases due to ischemia or myocardial infarction. It also includes sclerosis and other degenerative changes that involve not only the sinus node but the whole AV conduction system. · Sick sinus syndrome may manifest abruptly with frank syncope or sudden death. It can also occur more insidiously and may remain asymptomatic for several years before it becomes fully manifests. Thus, it may be difficult to differentiate sick sinus syndrome from reversible causes of sinus node dysfunction. · Among the more common conditions that can be mistaken for sinus node dysfunction are blocked PACs and sinus arrhythmia. o Blocked PACs:When a premature atrial complex or PAC occurs too prematurely, before the AV node or the rest of the conduction system has fully recovered from the previous impulse, the PAC can be blocked at the AV node resulting in premature ectopic P wave that is not followed by a QRS complex. This is usually identified by the presence of nonconducted P wave superimposed on the T wave of the previous complex. Nonconducted PACs and not sinus pauses are the most common causes of sudden lengthening of the P-P or R-R intervals. Nonconducted PACs should be recognized because they are benign and do not have the same prognosis as patients with sinus node dysfunction. The pause caused by the nonconducted PAC is not an indication for pacemaker therapy. o Sinus arrhythmia: Sinus arrhythmia is present when the difference between the shortest and longest P-P interval is >10% or 0.12 seconds (120 milliseconds). Sinus arrhythmia is a normal finding; however, the irregularity in the heart rate can be mistaken for sinus pauses, especially when there is marked variability in the R-R (or P-P) intervals. 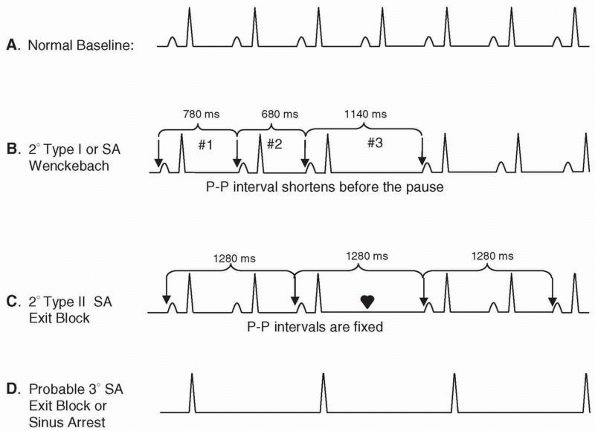 The pause resulting from sinus arrhythmia is not an indication for pacemaker therapy. § Respiratory sinus arrhythmia: Sinus arrhythmia is usually cyclic because it is respiratory related, resulting in increase in sinus rate with inspiration and decrease in rate with expiration. This has been ascribed to reduction of vagal inhibition during inspiration, resulting in shortening of the P-P and R-R intervals. The marked variability in the sinus rate is more pronounced in infants and young children. § Nonrespiratory: Sinus arrhythmia may be nonrespiratory related as would occur with digitalis therapy. § Absence of sinus arrhythmia: Absence of heart rate variability is more common in the elderly and in patients with diabetic neuropathy, which increases the risk of cardiovascular events. Thus, absence of sinus rate variability is often used as a marker for increased risk of sudden cardiovascular death similar to patients with low ejection fraction or nonsustained ventricular arrhythmias after acute myocardial infarction or in patients with cardiomyopathy and poor left ventricular systolic function. · Hypersensitive carotid sinus syndrome: Hypersensitive carotid sinus syndrome should always be excluded in a patient with history of syncope who is suspected to have sinus node dysfunction as the cause of the syncope. The symptoms are often precipitated by head turning. The diagnosis of hypersensitive carotid sinus can be confirmed by carotid sinus pressure while a rhythm strip is being recorded (see technique of performing carotid sinus pressure in Chapter 16, Supraventricular Tachycardia due to Reentry). A pause that exceeds 3 seconds during carotid stimulation is considered abnormal. · The presence of sinus dysfunction does not always indicate sick sinus syndrome. Extrinsic causes of sinus dysfunction are often reversible and should always be excluded. If sinus dysfunction is due to extrinsic causes such as hypothyroidism or sleep apnea, treatment of the hypothyroid state or the sleep apnea may not only prevent or delay progression of sinus node dysfunction, but may be able to reverse the process. Medications that can cause slowing of sinus rhythm such as beta blockers, non-dihydropyridine calcium channel blockers, rauwolfia alkaloids, digitalis, and antiarrhythmic and antipsychotic agents should be eliminated. Thus, treatment should be directed to the underlying condition, which is often successful in reversing the arrhythmia. · In patients with sinus bradycardia, sinus pauses, or supraventricular and ventricular rhythms with rates ≥50 bpm who remain asymptomatic, no therapy is indicated other than to identify and correct the cause of the bradycardia. Although sinus pauses of 3 or more seconds is considered pathologic, it does not necessarily imply that a permanent pacemaker should be implanted if the patient is completely asymptomatic. · When prolonged asystole occurs during cardiac monitoring and the patient is still conscious, forceful coughing should be instituted immediately. Forceful coughing is commonly used to terminate bradyarrhythmias in patients undergoing coronary angiography but is seldom tried in other clinical settings. Because it needs the cooperation of a conscious patient, it should be tried as early as possible. Cough may be able to maintain the level of consciousness for 90 seconds and can serve as a self-administered cardiopulmonary resuscitation. · When there is symptomatic bradyarrhythmia because of sinus dysfunction, atropine is the initial drug of choice. Atropine is given intravenously with an initial dose of 0.5 mg. The dose can be repeated every 3 to 5 minutes until a total dose of 0.04 mg/kg or approximately 3 mg is given within 2 to 3 hours. This dose will result in full vagal blockade. If the bradycardia remains persistent in spite of atropine, transcutaneous pacing should be instituted. If a transcutaneous pacemaker is not effective, is not tolerable, or is not available, sympathetic agents such as epinephrine, dopamine, isoproterenol, or dobutamine may be given until a temporary transvenous pacemaker can be inserted. The treatment of symptomatic bradycardia is discussed in more detail in Chapter 8, Atrioventricular Block. · The use of permanent pacemakers is the only effective treatment available but is usually reserved for symptomatic patients with sick sinus syndrome. The symptoms should be related to the sinus node dysfunction before a permanent pacemaker is inserted. In patients with the tachycardia-bradycardia syndrome, insertion of a permanent pacemaker is the only therapy that is appropriate, because there is generally no effective therapy for bradycardia. Furthermore, pharmacologic treatment to control tachycardia or to control the ventricular rate in atrial fibrillation will result in further depression of the sinus node, in turn resulting in more pronounced bradycardia when the patient converts to normal sinus rhythm. The indications for insertion of permanent pacemakers in patients with sinus node dysfunction according to the ACC/AHA/HRS guidelines on permanent pacemakers are summarized in Figure 12.38. · sinus syndrome from idiopathic degenerative disease is usually progressive and may involve not only the sinus node, but also the whole conduction system. Thus, atrial pacing combined with ventricular pacing should be considered in these patients. When AV conduction is intact, a single-channel AAI pacemaker may be sufficient. Dual-chamber programmable pacemaker with automatic mode switching from AAI to DDD may be more appropriate in anticipation of AV block or atrial fibrillation that often develops in patients with sick sinus syndrome (see Chapter 26, The ECG of Cardiac Pacemakers). · The use of dual-chamber pacemakers compared with single-chamber VVI devices may diminish the incidence of atrial fibrillation in patients with sick sinus syndrome. Mode switching pacemaker, capable of automatically switching from DDD to VVI, may be advantageous in patients with intermittent atrial fibrillation. · Anticoagulation should be given to patients with chronic atrial fibrillation to prevent thromboembolism. This is one of the common causes of death in patients with sick sinus syndrome manifesting with chronic atrial fibrillation (see Chapter 19, Atrial Fibrillation). · In patients with sinus node dysfunction who are completely asymptomatic, there are no clear-cut indications for insertion of a permanent pacemaker according to the ACC/AHA/HRS guidelines. · Although there is no effective chronic oral therapy for bradycardia associated with sick sinus syndrome, some patients with sinus pauses >2.5 seconds who are symptomatic but refuse permanent pacemaker insertion, slow-release theophylline, 200 to 400 mg daily given in two divided doses, may be tried. This is based on the observation that sick sinus syndrome is associated with increased sensitivity to adenosine. Thus, theophylline, which is the antidote to adenosine, may be able to reverse the bradycardia resulting from sinus pauses. Hydralazine in small doses of 15 to 100 mg daily in divided doses has also been tried with varying results. · When sinus dysfunction is due to isolated degenerative disease of the conduction system, the prognosis in these patients with sick sinus syndrome who receive permanent pacemakers is good and is similar to patients in the same age group without sick sinus syndrome. · The prognosis of other patients depends on the underlying disease causing the sick sinus syndrome. 2005 American Heart Association guidelines for cardiopulmonary resuscitation and emergency cardiovascular care: Part 7.3, Management of symptomatic bradycardia and tachycardia.Circulation. 2005;112:67-77. Belic N, Talano JV. Current concepts in sick sinus syndrome II. ECG manifestation and diagnostic and therapeutic approaches. Arch Intern Med. 1985;145:722-726. Blaufuss AH, Brown DC, Jackson B, et al. Does coughing produce cardiac output during cardiac arrest? [abstract] Circulation. 1978;55-56 (Suppl III):III-68. Buxton AE, Calkins H, Callans DJ, et al. ACC/AHA/HRS 2006 key data elements and definitions for electrophysiology studies and procedures: a report of the American College of Cardiology/American Heart Association Task Force on Clinical Data Standards (ACC/AHA/HRS Writing Committee to Develop Data Standards on Electrophysiology. J Am Coll Cardiol.2006;48:2360-2396. Criley JM, Blaufuss AH, Kissel GL. Cough-induced cardiac compression. JAMA. 1976;236:1246-1250. Ferrer MI. The Sick Sinus Syndrome. Mount Kisco, NY: Futura Publishing Company; 1974:7-122. Epstein AE, DiMarco JP, Ellenbogen KA, et al. ACC/AHA/HRS 2008 guidelines for device-based therapy of cardiac rhythm abnormalities: a Report of the American College of Cardiology/American Heart Association Task Force on Practice Guidelines (Writing Committee to Revise the ACC/AHA/NASPE 2002 Guideline Update for Implantation of Cardiac Pacemakers and Antiarrhythmia Devices). Circulation. 2008;117: e350-e408. Lamas GA, Lee KL, Sweeney MO, et al. Ventricular pacing or dual-chamber pacing for sinus-node dysfunction. N Engl J Med. 2002;346:1854-1862. Mangrum JM, DiMarco JP. The evaluation and management of bradycardia. N Engl J Med. 2000;342:703-709. Olgin JE, Zipes DP. Specific arrhythmias: diagnosis and treatment. In: Libby P, Bonow RO, Mann DL, et al. eds. Braunwald's Heart Disease, A Textbook of Cardiovascular Medicine. 7th ed. Philadelphia: Elsevier Saunders; 2005:803-810. Saito D, Matsubara K, Yamanari H, et al. Effects of oral theophylline on sick sinus syndrome. J Am Coll Cardiol. 1993;21: 1199-1204. Strickberger SA, Benson W, Biaggioni I, et al. AHA/ACCF scientific statement on the evaluation of syncope. J Am Coll Cardiol. 2006;47:473-484. Vijayaraman P, Ellenbogen KA. Bradyarrhythmias and pacemakers. In: Fuster V, Alexander RW, O'Rourke RA, eds. Hurst's The Heart. 11th ed. New York: McGraw-Hill Medical Publishing Division; 2004:893-907. Weiss AT, Rod JL, Lewis BS. Hydralazine in the management of symptomatic sinus bradycardia. Eur J Cardiol. 1981;12:261. Wolbrette DL, Naccarelli GV. Bradycardias: sinus nodal dysfunction and atrioventricular conduction disturbances. In: Topol EJ, ed. Textbook of Cardiovascular Medicine. 2nd ed. Philadelphia: Lippincott Williams and Wilkins; 2002: 1385-1402.